Hardware store brushes do come in larger sizes, which can make for helpful lay-ins, priming, sealing or gessoing. However, the quality of the hair and the overall quality of the brush is not usually as high for working with artist mediums. You're not going to find a hardware store brush with the soft synthetics or quality bristle that you'll find in a fine art brush. That is okay for working with latex paint on woodwork or furniture, and it might be okay for priming. But, if you're looking for an ultra smooth finish, those rougher hairs will leave deep brush marks, hard to remove by sanding or painting over. Also, some hardware store brushes can lose hairs easily so brush out the tufts before you use them. Hardware store brushes these days are machine made, including the tufts. They might be trimmed to the proper shape, eliminating those wonderful natural flags. They also have different ferrules and often plastic handles, each wears much differently than a fine art brush. Our vice president of operations and chief innovator, Jeff Mink, weighs in, "Brushmaking techniques used in a hardware store brush is different than artist brushes. [They] typically use filler stripes in the ferrule, which help the brush form an edge and also reduce the amount of bristle in the brush itself." Artist brushes, however, do not have filler strips. The hair quality and brush making techniques are used to create the fine edge needed in high quality artist brushes. It is best to know the medium you're using first, to know your style and what you need out of brush. Sometimes a hardware store brush can work for just the right technique. Most importantly, if you find a brush hair that you like, but you cannot locate the size and shape. . . ask the manufacturer. It is a huge part of our business to design brushes that match the characteristics artists need. As the year draws to a close, many of you might be considering how to do better in sales next year, setting up organizational sites, online galleries and finding opportunities to list your art that you didn't know about before. So here, I'm compiling a list of online galleries for just that purpose. Once again, this list is not comprehensive (yet), so if you know of other galleries, please share and I'll add them here. FASO -- An easy way to build a website of your portfolio with free access to art marketing advice. There are levels of features depending on how much you want to invest. EBSQ -- A network for self-representing artists to teach and exhibit. Society6 -- Place to view and purchase copies of art, Artists can sell work without losing their copyright. ETSY -- Everything thing is there to create an online gallery and sell. Fine Art America -- A professional network for artists, galleries and collectors. A place to build a gallery, sell directly, link to other social networks and sell accessories and prints. Zatista -- A fine art gallery to sell and promote one's work to collectors, designers and galleries. There is a 30% commission for them. Saatchi -- An online gallery for selling originals and prints based out of the Saatchi Gallery in London. There is a 30% commission to them. Leap Direct -- A place to build a website or online portfolio and communicate with other artists. A social network for fine artists. Body of Art -- a free website to share and exhibit art online as well as lists of resources for finding galleries, studio space and competitions. Collectors can contact artists directly through the message system to purchase works. Blue Canvas -- A place to share your art and connect with other artists, online forums, galleries, events, classifieds with a quarterly magazine. Buyers can contact artists through the system, prices can be listed on work, but no sales go through the site. Thank you to Artonomy for their resources and guides. What other online galleries do you use? Our Faux Squirrel brushes are hot, if I do say so myself. The kind of brush you immediately want to touch when you see it. Some artists buy these just to hold from time to time. The hair is an exceptional synthetic, and the comfortable handle is exclusive to this brush, made for working long periods. The Faux Squirrel series is the most popular with watercolor and acrylic ink artists. Its supple spring and large belly hold ample fluid for washes and full brushstrokes. Being a synthetic hair brush, it holds its point and shape incredibly well, showing little wear over time. Since this brush is so popular, it comes in more than the standard shapes, too: round, flat, oval wash, angle, dagger, fan, rigger and quills, plus some patented Dynasty shapes: wave filbert, wave flat, whale tail, wave angle and fountain. You can see my post on shapes for more info on all of these. Annie Strack, one of our featured artists has been using the Faux squirrel brush regularly in her watercolor work. She shares her thoughts on the reliability of this brush, "I prefer large brushes because they hold more paint and water, which allows me to make larger, bolder statements with each brushstroke. The Faux Squirrel brush from Dynasty holds plenty of paint and water, and forms a perfect pointed tip that lets me paint small details or broad washes with the same brush. The brush holds its shape beautifully and has just the right amount of spring in the bristles to give me precise control of every brushstroke. I use this brush on all sizes of watercolor paintings, and for all types of techniques. It's the kind of brush that can be used for every part of a painting from start to finish." Kendra Ferreira is one of those artists who has both a spectacular eye for detail and a style that recreates her subject in a painterly way -- very hard to do with colored pencil. 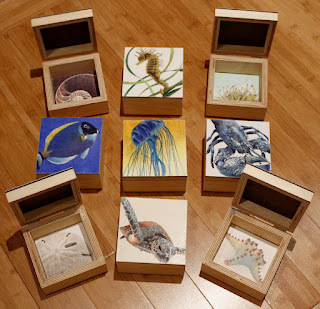 But Kendra pulls it off with a high degree of technical skill and talent, and is noted for her colored pencil work, often mistaken for paintings. 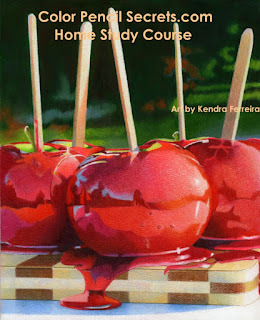 When Kendra first picked up colored pencil, she was in college. Naturally, she gravitated towards the medium with a strong background in drawing and graphic design, and a BFA in printmaking. But, at the time, she was working primarily dry, attempting to get an even surface with the colored pencils. 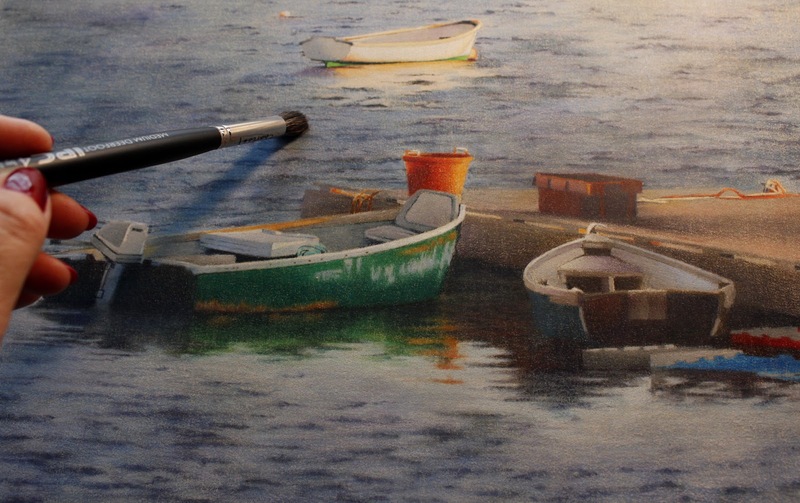 Through her membership in CPSA, the Colored Pencil Society of America, Kendra was introduced to new surfaces and new possibilities for blending. Not all colored pencil and pastel artists use brushes, but when they do, there are specific needs based on the surface and type of pencil they use. In her work, Kendra chooses different substrates for differently styled pieces and alters her brush work accordingly. When using a sanded surface, Kendra burnishes the pigment down into the surface with a soft blending brush. Bristle brushes can work for this, but they will wear down quickly. The IPC line, Ink, Pastel and Chalk, has some alternatives with slightly softer, but stiff, synthetic hairs made just for this task. 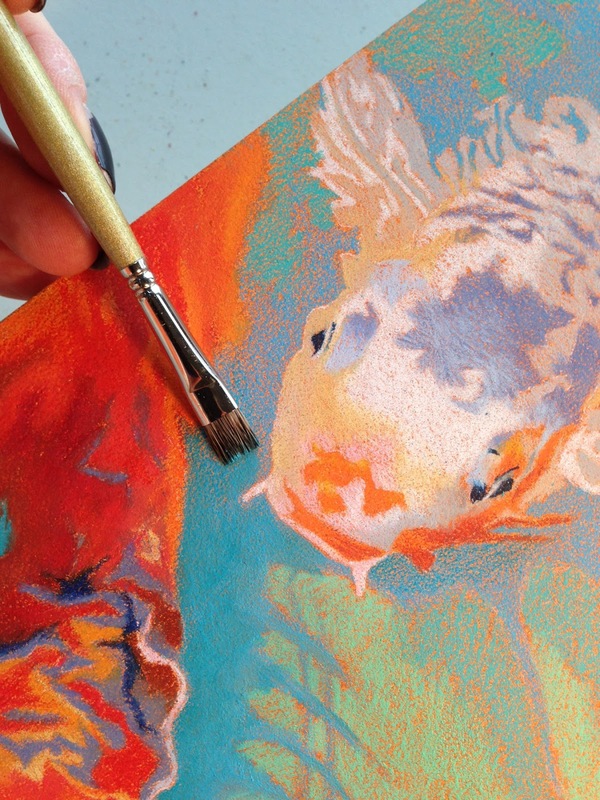 In choosing to blend the colored pencil with solvents, Kendra uses an even softer brush, usually those meant for watercolor. Once the drawing is complete and the colors filled in, Kendra uses an odorless mineral spirits, Gamsol, to blend the piece. The softer brushes, like the mongolian sable she uses here, work easily to move the pigment. And, these brushes hold up extremely well with solvents, being quite easy to clean. A close look at this piece will show that the original drawing is rather textured, but the blending gives the painterly touch that Kendra is known for. With her skill and output, Kendra's work and teaching is highly sought. If you're interested in learning more about Kendra and her work, including a new online course, tune in to her blog and website. Kendra currently has a show on display at the Providence Art Club, Body and Soul, featuring the amazing Claybord box series along with hanging 2D work. The show will be open through November 9. On November 15, her show in Bristol, RI at Angelina's shop will open and run for three weeks. Keep your eye out for the issues of Colored Pencil magazine, they will be featuring Kendra in an upcoming article.